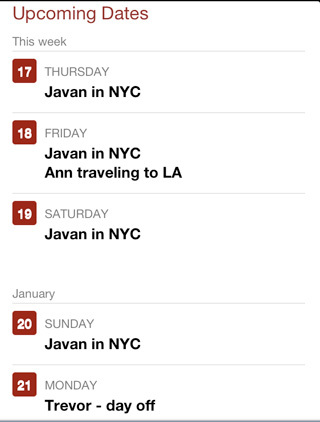 While there's no built-in calendar in the mobile view, you can see your upcoming dates! Visit a project, then scroll to the bottom to view "Upcoming dates.” You can see your full calendar by switching to the Standard View. Another option is to add your Basecamp iCal feeds to the calendar on your mobile device. Here's a walkthrough for retrieving iCal feeds. Switch to the "Standard View" on your mobile device (at the bottom of any page). Go to Calendars, then "Subscribe to iCal" on the left. Hold down the link to the calendar you want to subscribe to. Tap "Copy" on the menu that pops up. Go to your iOS device's Settings app, choose "Mail, Contacts, Calendars," then "Add Account," and select "Other." Tap "Add Subscribed Calendar." Hold down on the "Server" field that appears and choose "Paste." Click "Next" and then "Done" to save the calendar subscription.